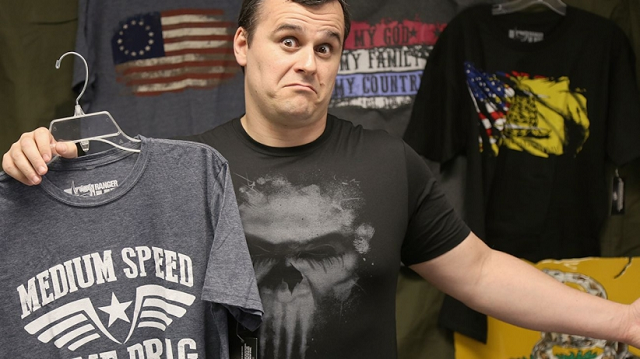 His military students were complaining they got no cool T-shirts, so Nick Palmisciano made some for them—that was the start for Ranger Up. US Army vet Nick Palmisciano put some funny words on a T-shirt as a hobby while getting his MBA at Duke. Thirteeen years later, that hobby has morphed into a $20 million apparel and media company, Ranger Up. "The students were always complaining that they didn’t have cool military T-shirts. Everything at the time had been skulls and snakes and 'Death from Above'—they looked like biker T-shirts. So I started making funny T-shirts for my students, not charging anything for them. I had one with Saddam Hussein looking just like Ron Burgundy in Anchorman, and it said, 'You stay classy Iraq.' My students loved them and said that I should start a company. But I didn’t right away." "At the same time, I kept getting promoted at John Deere. It got to the point where I was a manager of mergers and acquisitions, which was a couple of billions-dollar division. One Friday I heard I was going to get promoted again. I did some soul searching over the weekend and gave my notice on Monday. I felt like if I took that bigger job, there would be no way I could break away from that money train. I jumped into entrepreneurship for real at that point." "I sold all of my stocks, maxed out two credit cards and I had $1,300 left to my name. Then the next month I had $1,350, then $1,500, and it just went on from there. It was rough in the beginning, but there was no temptation to call back John Deere and ask for my job back. I knew there is nothing worse than regret." "I’ve always been a person who sets a goal and goes after that goal, and I think I learned that from wrestling more than anything. You get out of wrestling what you put in. It’s such a brutal sport. When you lose, you personally lose. And when you win, you personally win. It’s the most emasculating thing ever to lose. And so that sport helped shape who I am." "When you’re an entrepreneur, you have to understand that no one is going to swoop in and save the day. People think entrepreneurship is exciting and fun, but the truth of the matter is that it is a grind. It’s not about the end zone, sitting on a beach with a drink, it’s about solving problems. You have to enjoy solving problems for your customers and for your business." "We help people connect with organizations that can provide help. I’ve personally gotten on the phone with despondent people. We really care about our customers. They’re more than customers to us, and we’re more than just another company to them." "Warning: Don’t bring your kids!"